Better late than never right? I've not been home much since the quilt show last weekend so I haven't been able to process the photographs and share my good news. Finally I have a little spare(ish) time and I thought I should get on with this report. 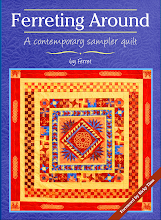 The sample quilt from my book Ferreting Around was one of he quilts I entered. I had wanted to put in Tet's quilt but you can't enter Malvern and Sandown in the same year, so I thought mine could have an outing. It is what it is, a sample. 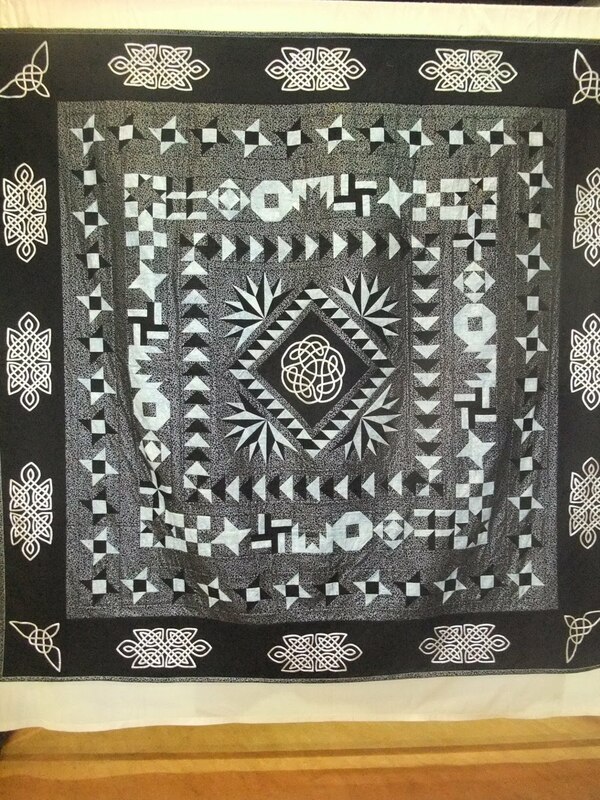 If you look in the book this is the quilt you see being made. I couldn't see it winning any pizes, but it was nice to see it on display especially as it wasn't allowed to be the cover quilt of the book. I forgot that there isn't a show guide at Sandown, but I hope the Home Workshop folks had time to read the statement with it. They really have given me a lot of advice about producing books, and I do appreciate it. Another quilt I put in with no expectation of it winning anything was Bad Rain. 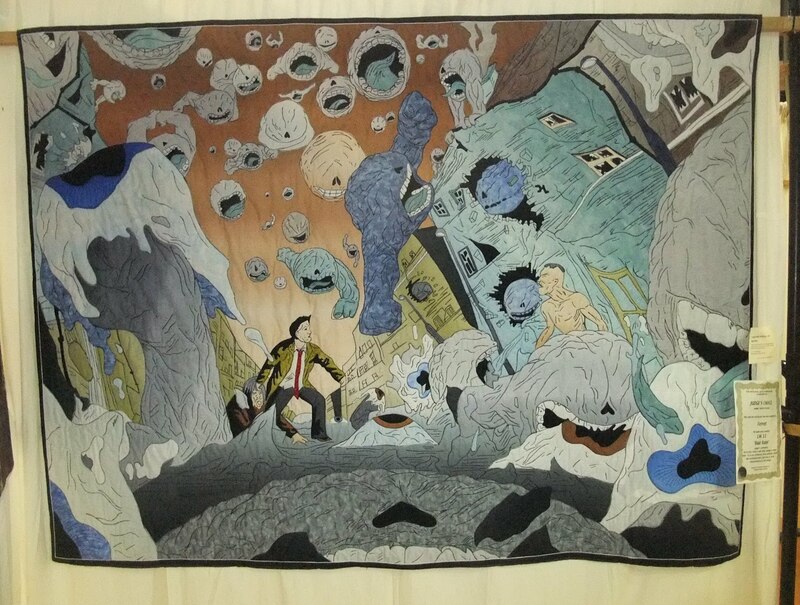 This is the quilt of a double page spread from the book Cancertown. It's a large quilt and there aren't many chances for me to display it in the quilting arena, so I took this one. I was very surprised (and thrilled) to see it sporting a Judges Choice certificate. Even more surprising was the number of people who came and talked to me about it. It made an impression and for a lot of people a positive one. I have to admit I just enjoyed seeing it hanging. 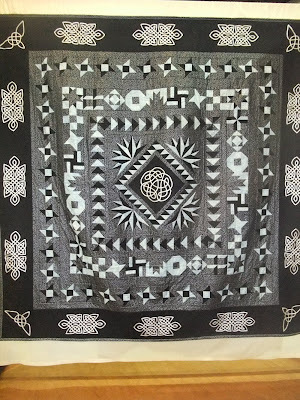 I also think it is good for the quilts to hang, and this one lives rolled up in a storage unit most of the time. It does get a few outings to talks, but not as many as I would like. Opposite Bad Rain was Herd Mentality. I am always being asked to show this quilt and that was why it apeared here. The layout of the quilt stands isn't ideal for either of these two quilts as they are best viewed from a distance, but you take what you can get. I think you can get a reasonable view of them when you stand back. From what I saw this quilt was one of the most popular with small people. The number of children I saw wanting to stroke the cows was amazing, and thank you very much to all the parents who were so careful to restrain the small fingers. This will be it's last appearance in the UK for a while as it was accepted into the World Quilt Show and is heading off to tour America. On the other hand if you're reading this from the US please keep and eye open for it and send me a picture if you meet it at a show. I do enjoy seeing my quilt's holiday photos. The rosette on the cows is first place in computer aided design. All of my art quilts are based on photographs which I process on the computer to produce patterns. This one more than most, as the relative brightness of various parts of the image were adjusted first to give the more detail in the final pattern. I'm really pleased to have won the award and I rather like the silver plate that comes with it. I got an angular geometric one rather than one of the more frilly plates. Funny how these things seem to just work out. 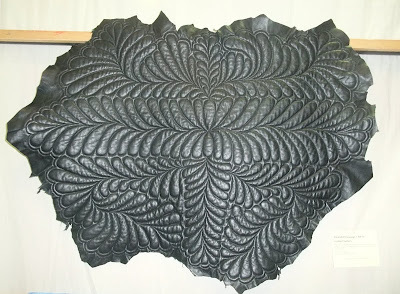 Given how popular my other leather quilt had been at Malvern, I thought that this one might have done well at Sandown. I guess I spoilt people with Leather Star. This one, Leather Feathers was the first piece of leather I quilted and I did get more comfortable with it on the second one, the star. It was nice to have it there, anyway as lot's of people hadn't been to Malvern and were fascinated by the idea of quilting leather. It is a very stressful thing to do, but at the same time wonderful. The leather feels so nice to quilt on and I love the smell of it. On the other hand you can't make mistakes as they leave holes you can't heal. 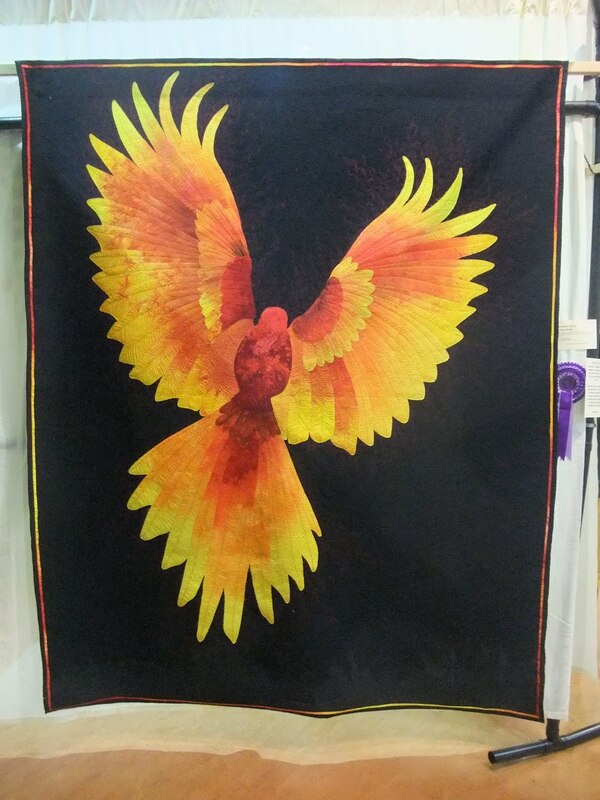 Finally there was my entry into the bed quilt category, Phoenix Rising. This is generally the biggest category of the show and I would say the mst fiercely contested. 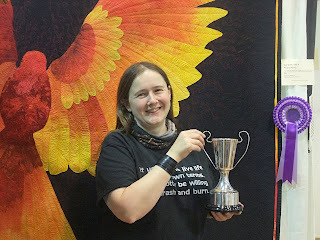 I think for many quilters this is the award (other than champion quilt) that they most want to win. I entered this quilt here because it is my quilt. Maybe that should be MY quilt. It is the most me I have done in a while and I love it. I thought I didn't care what anyone else thought I just loved it. 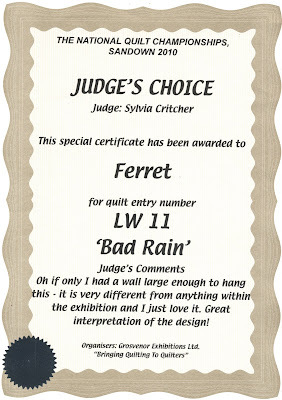 Well on judging day I woke up worried, I wanted this quilt to appeal to the judges. I feel that is a very dangerous desire. It seems to me to be a very good way to disapointment. Generally I manage to avoid it but this just crept up on me (I wonder if it had struck earlier if I would still have entered the quilt). Of course at that point all I could do was wait and see what happened. Part way through my afternoon class my phone went. It was Vicky and the first award she told me about was this one. I was so relieved. Yup, relieved. 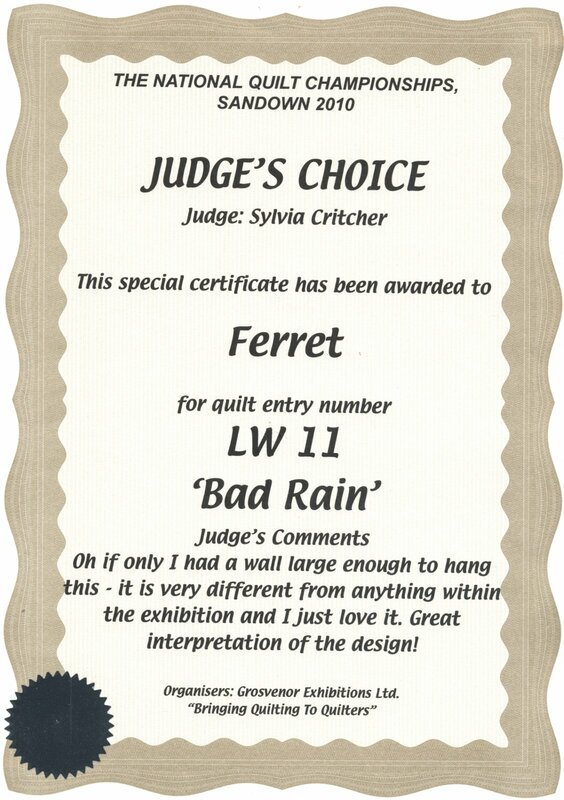 After a while I makde it to thrilled, winning the bed quilt category was cool, but not as good as just knowing the judges did think MY quilt was OK. I'm sure blind faith in your work is a great thing to have, but I haven't really got it. 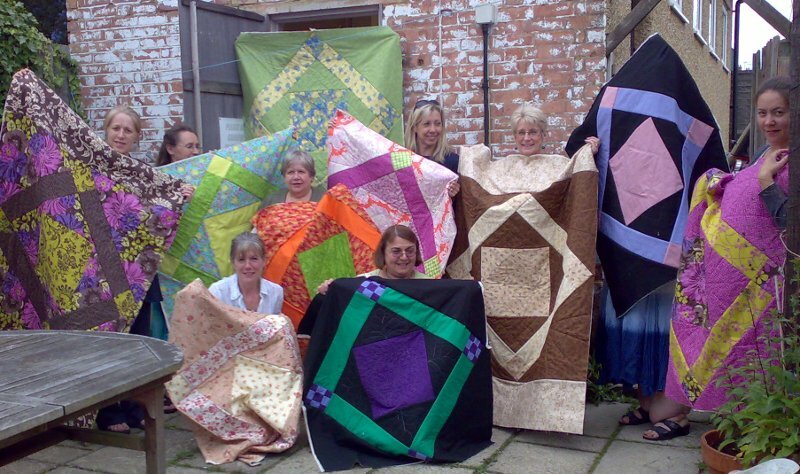 Maybe this quilt was just more important because it is more personal than some of them, or maybe it is because it hasn't done well with US judges. I don't know but as you can see I am very pleased with it's award. I hope that some of you will be inspired to enter this show next year. It really is a great place to get your feet wet and start showing your quilts. It is a thrill just to see your work hung up, as one of my students discovered today (more on that later). You really never see your work as well as you do in a show. Also if you like looking at quilts in shows you can help by sharing your work. The shows can only carry on while there are quilts to see. No entries, means no quilts, means no show. If you're local you can do what I do and deliver to the show then collect on the Sunday. 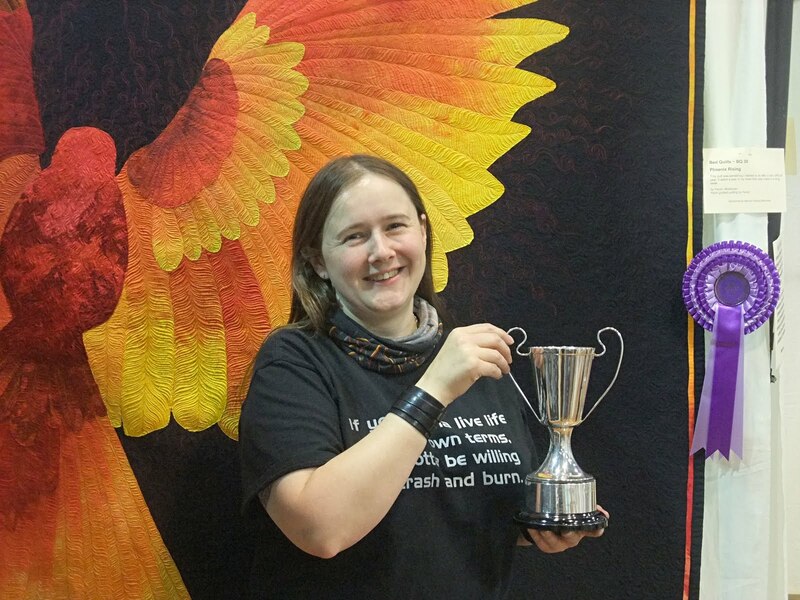 You get a ticket with your entry so you can get in for free, and it's a great chance to catch up with other quilter while you wait for your quilt to arrive. Give it a go, you never know, you might enjoy it. Forms can be obtained from Grosvenor Exhibitions. I need a break from cranking my portable machine so I thought it migth be a good time to catch you guys up on some of my travels. 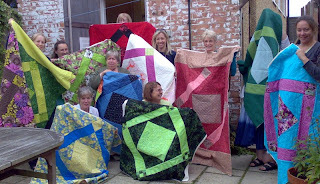 Tuesday morning I was speaking to Romsey Quilter, in Romsey, unsurprisingly. As I am not a fan of early starts or the M25 at rush hour I went down on Monday evening. I was put up in an amazing barn in the New Forest. On route I got stuck behind a car driving very oddly. It slowed down as though waiting for someone to pass (it was a very narrow road) but no one did then it moved on. 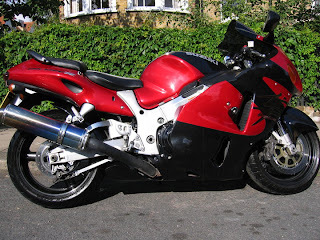 With all the bends and high hedges I couldn't see what the problem was and I was very reticent to try overtaking. Eventually the road straightened enough for me to see the problem, cows! Lots of them trying to make their way to be milked but being very distracted by anything that might be food. They were really not interested in letting cars through. I suppose that was rush hour for the area. It was a lovely place to stay and a very relaxing evening, so come the morning I was well prepared to talk. I thought we arrived at the hall very early, an hour before the meeting, but no. Here people are keen, very very keen. They were even keen to carry things in from the car for me which is very much appreciated when I am on my own. When I say car full that is what I mean. They also take the prize for most offers of a drink. I got the impression that everyone in the room was trying to help and look after me. Whenever I needed something it just happened. As an audience the group were very appreciative and asked interesting questions. They came up with some new ones I haven't had before. I am sure had I had more time they could have kept asking. Unsurprisingly packing was fast and efficient, thank you all for your help. From there I had to get to the V&A in London for 3pm. The traffic was good and I made it, althoug the tube didn't help at all. A good service is not one which will terminate early or is running late. Well maybe it is by some peoples definitions, but not mine. At the V&A there was a talk giving some backgrouund information on the quilt exhibition. There was some interesting information in it, but the best part was seeing some quilts that didn't make the show. They had three for us to look at. One was a grandmothers flower garden, which did nothing for me. One of the otheres though was a gem. It had the sort of feathers we quilt in borders pieced into the top. It was amazing. They background patterns were unusual too, but the feathers really appeal. The third quilt was a ribbon quilt which reminded me of a lot of modern quilts. It's a shame there are so many quilts in the V&A collection that are never seen. Apparently this is the first quilt exhibition there since the 1930's. Well that's my break over. I want to get some more sstrips joined before class. i am working on Royal Treasures by Starrdesigns.com. It's been a while since I posted an update on this quilt. It is a project I was talked into by my Wednesday morning students. They didn't feel they were keeping me busy enough in class so suggested I do some sewing. This is the project we chose. It is based on a Ricky Tims Rhapsody quilt but with a few modifications. As you can see it's starting to grow. I usually manage to either prepare 6 piecies or put on a set I made th week before. Today we were a bit thin on the ground so I got a whole set prepared and three of them onto the quilt. Just time for a quick lunch then on to the afternoon class. 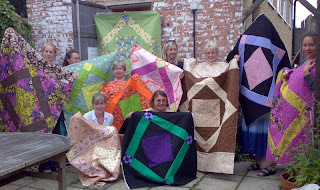 If you would like to have a go at this class or one of the earlier speed quilts your next chance is the Nimble Thimble summer school Friday 13th August. If you can't make that it will be running again at Patchwork Corner in November, watch their website for details. Well technically piecing. This quilt will be over 100" so I don't fancy it for my first quilting project on a hand cranked machine. I haven't had a chance to get the power in the van sorted out so I have been looking for non electric solutions. Solar lighs and a hand crank machine. It's a joy to work on actually and surprisingly fast. 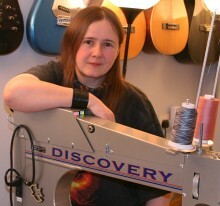 I suspect it will be great for curved piecing because of the amount of control you have. I have to admit I just love the idea of piecing a big quilt top without power. It's one of those things you just have to do if you can. 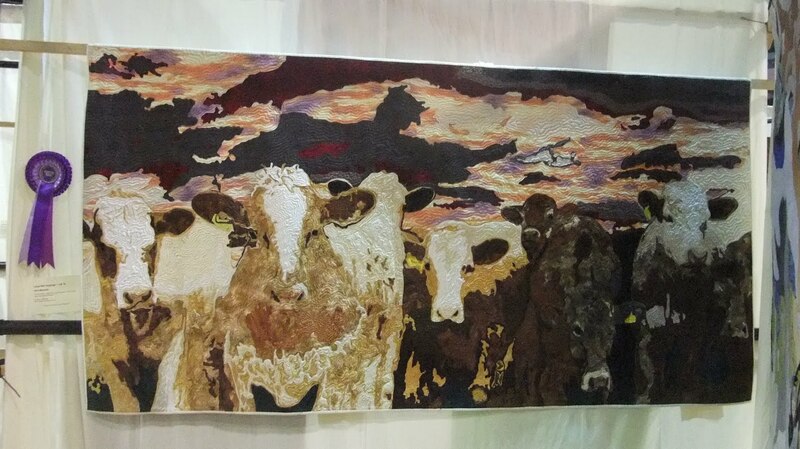 I like the Sandown Quilt Show. It's daft but it feels more friendly than the other shows. Yet it's the same people doing the same things so it can't really be any different. I do love that my quilts are away for less than a week, and delivering them is always an outing. I like chatting to the other people who are delivering. It's fun to then try and spot their quilts in the show (when often you've only seen the back). Maybe it's because this was the first show I got an award at that makes it feel like home, but whatever it is I love it and it does feel like my home show. Because I can deliver direct to the show it is also the easiest place for me to send difficult quilts. Outsize or delicate (or both) they can all go here. Hope to see some of you there on Sunday. I'll be collecting my quilts at the end of the show. Are you starting to worry about the long break in quilting classes over the summer? Yes. Thought so. Well this year there is a summer school you can try . It is being run by The Nimble Thimble, in Buckingham and I am really hoping it will prove popular. Among there classes are two of mine, Speed Quilt and Autumn leaves. This Speed Quilt class will cover all the first four patterns so if you've missed one this is your chance to catch up with it. 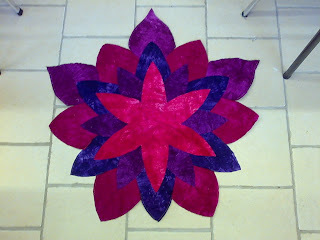 If you search for speed quilts on this blog you will find pictures of the first three. Autumn leaves is the class where you can make a quilt like Golden Storm. There is also a chance to catch my talk, Quilter? Artist? Lunatic?. The talk will be Friday 13th August, it's free but you do need to register to say you will be coming, contact the Nimble Thimble. I did try posting this earlier, but for some reason it never came up. Still it's here now. Today I was teaching in Chiltern Candover in Hampshire. As you can see the class were still hard at work after lunch. It was a close call, we thought we might have to get everyone to run around the cricket pitch after the very fine lunch by Izi. It was one of those meals where your full but it's so good you keep eating. Still I guess once in a blue moon you can get away with that right? It's a fantastic hall, complete with a digital projector. For the first time I was able to display my laptop screen for the whole class and teach them the image processing all at the same time. It was great. I loved being able to see everyones reactions to what I was saying, and it gives a much better feel for wether people are understanding what I am saying. Unfortunately I don't think I can afford one for myself just yet. Belive me it is on my wish list. This booking came about from one person, Mandy Parks, missing out on a class at the Festival of Quilts last year. So she organized the whole event. As well as being a lot of fun it is a very cost effective way to get a class, if you can find a reasonably priced venue. If you look closely at the picture you will be able to see the days project well underway. 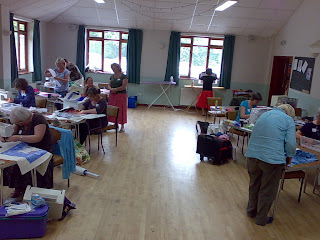 This is the Art Quilts By Numbers class, where everyone will make either a rose or a swan wallhanging in the day. Most people will get the image together in the day. In fact I think the only one who didn't quite get there today missed quilt a lot of time running around and looking after us, so who knows, without interuptions she may have finished too. I was very lucky with my accomodation last might. I didn't really fancy driving that far on a Monday morning, so Mandy put me up. Wow! Four poster bed and a spare cat. How cool is that? Given how tired I am after a decent nights sleep I hate to think how bad it would be if I had had to drive both ways today. 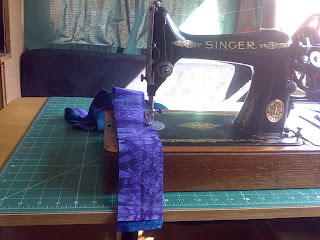 One of my other stitching project recently has been altering a wedding dress. It's something I do, but I do find it quite stressful. Brides can be quite stressed. This can make them tricky to deal with and prone to changing shape. Both make it very hard to do alterations successfully. I thought I was going to be OK with this bride, but you never know. I was right. She has been great to work with and the look on her face tonight with her dress fitting well and the bustle in place made the work worthwhile. I hope she will have an amazing wedding, it's in Sweden, so from my point of view, it's bound to be good. I wish them both all the best, they are a lovely couple. If you see this bike around with the above number plate, please report it to the police. It belongs to a friend and was stolen last night in East London. I know how it feels to have a much loved vehicle stolen and it would be great to bring the culprits to justice. 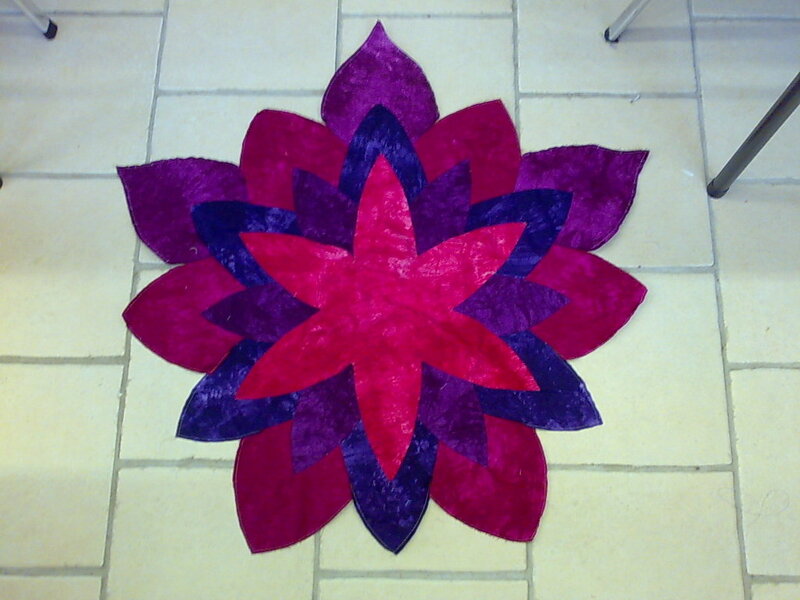 I've just got home after speaking at Thanet Quilters. It was nice to get down to Kent again, but it is a long trip. Not helped by the M25 having problems in both directions. Still I got home quicker than I expected so I'n not too bothered. I will say that we really need another decent set of services on the M25. Thurrock is even worse than South Mimms which isn't too good. As this was the first time for the van to do a talk I wanted to leave myself extra time, so I decided to leave midday and visit Canterbury on the way. My has it changed. Admittedly it's been at least 17 years, but still. Strangely it has been improved to the point that I felt it had died and started to feel run down. It wasn't as busy as when I was there. It does however have official parking for motorhomes with 'quick and easy' pay by phone scheme. Quick and easy for who exactly? We gave up and used our float to pay the rather large parking charge. You had to buy 12 hours parking minimum. Excessive for the hour or so we were there but it was nice to know we were safely parked. From there we headed on towards Margate. Sturry road has changed a lot too, and again I'm not sure it's all for the better. It was interesting to revisit the area. We arrived in Birchington in time to grab dinner before the talk and found a reasonable fish and chip shop. By the time we made it to the hall, I was relaxed fed and ready to talk. Better still I could sit in comfort and get ready. I could get used to this taking your home with you business. I was stunned by the reception I recieved. I am so flattered by the turnout and the enthusiasm of the group. There were lots of interesting questions from interesting people. Not one but two men in the audience, and plenty of people leaving inspired to play with fabric. It's always nice when I've managed to inspire rather than depress. I bring a lot of quilts because that is what groups tell me they want to see. Just because I turn work out quite quickly doesn't mean everyone has to. A lot of the time my productivity is determined by deadlines. I've not felt able to turn work away and, well that means I need to do crazy things sometimes. I hope I will get to go back to Thanet and see what the groups have worked on after this. Oh and the other advantage of having a bit more space, I was albe to take my quilted chair with me. I don't often get to show it, so that was a big treat for me. Suppose I should probably head off to bed now, but I had to share. It's been a really good day if a long one. Thanks Thanet.